Sonic the Hedgehog 6 is the sixth issue of the Sonic the Hedgehog comic series. It was released in January 1994. This comic features two stories: The Spin Doctor, and Sonic's Christmas Carol. It also features one featurettes: Here Comes the Bribe!. 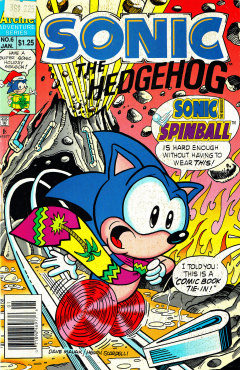 It is the first comic in the series to feature a direct tie-in to a video game release, namely Sonic Spinball. Sonic the Hedgehog leads on the Freedom Fighters to a surprise attack on Dr. Robotnik's factory in Robotropolis. Upon arrival, they notice the factory boarded up and a note on the door stating that Robotnik has moved his operations to Mount Mobius, an active volcano. Sonic rushes off to the volcano, solo, despite objections from the other Freedom Fighters. Sonic later arrives at Mount Mobius, a large active volcano with Robotnik's likeliness on it. He leans on a pair of rails leading into the volcano, standing infront of a pinball flipper. Robotnik, from inside the volcano, presses a button in his lair, activating the flipper and sending Sonic careening into lava. He jumps over the lava continuously onto the pinball rails, using them as a track for his legs. He runs into the volcano. Sonic first enters into the Toxic Caves, meeting with a Rexxon. Rexxon picks Sonic up and takes him to Scorpius. Sonic enters into a spindash and rebounds off the two, destroying them both. Robotnik reacts in anger as he watches Sonic continue through the volcano, but thinks he won't be able to go through the next level. Sonic, meanwhile, boards a freight car and heads to the Lava Powerhouse. While on the mine cart, Sonic encounters 4 Ferrons. Despite the overwhelming number, Sonic destroys them with ease and boasts at Robotnik through his monitor. Getting off the mine cart, Sonic hears many animal calls, only to be launched into a tube toward The Machine. Sonic arrives in The Machine, witnessing a ton of animals trapped in the Veg-O-Machine, a roboticizer. They warn Sonic to look behind him just as a bunch of pitcher plants try to eat him. He runs off toward a door leading to Robotnik, only to find it's a trap. A spring launches him out the top of the volcano. Tails grabs him in mid-air, while Sonic says he will return to destroy the base. Sonic is reading some fan-mail from a mailbox. The first letter he opens up has a reader, Brandon, asking for Antoine to appear more often. Sonic reacts in shock and anger as he keeps reading, with the writer stating that Antoine is the noblest Freedom Fighter, is brave, loyal, and has helped saved Sonic before. The writer goes so far to saying that the comic should be called 'Antoine'. Sonic marches off in anger to Antoine's room, finding Antoine writing a letter to Brandon thanking him for writing the letter he so asked and is enclosing a check. Robotnik Scrooge is talking to Rotor Walrus, asking him if he was saying he was a penny pincher. Rotor states he was simply asking when he will have the roof fixed, as the room is full of snow. Robotnik yells at Rotor, saying he'll spend his money when he feels like it. Rotor then asks if he can have the next day off, which Robotnik declines, as his factory must run everyday. Rotor promises to make up the time, which makes Robotnik change Rotor's lunch time from 5 minutes to 1 minute for 10 years. He chases Rotor out of the factory as he heads home. That night, Robotnik is sitting in his mansion, watching television and eating petroleum pudding. Suddenly, the image of burning rubbish on his television changes to an image of the ghost of Jacob Snarley. Robotnik tries to change the channel to no avail. Snarley warns Robotnik that he needs to change his ways or become like him. Robotnik ignores him, and kicks the television, damaging it and making Snarley disappear. Later that night, at midnight, Robotnik is attempting to sleep, hiding under the covers in fear. He hears a noise and peeks out of the covers, watching as Sonic arrives infront of the bed on a skateboard as the Spirit of Christmas Past. He grabs Robotnik, despite his objections, and travels to the past where a young Robotnik is enjoying setting up the house for Christmas with Sonic under the watch of Uncle Chuck. Robotnik watches as his younger self, however, grabs Uncle Chuck's tractor and heads to ram the Christmas tree and put the blame on Sonic. The young Sonic digs a trench around the tree to protect it, to the anger of old Robotnik. He runs forth to stop the young Sonic, only to trip and land his face in a bowl of Christmas mush. He looks up to see he is now in Knothole Village, the home of Rotor. Sonic has now been replaced with another Sonic wearing a present, proclaiming himself as the Spirit of Christmas Present. Tails arrives with a large package, which Robotnik instantly notices is a bomb he sent out. They decide to open it, Robotnik watching in glee, only to have Sonic arrive and take the package, wanting to return it to the sender in case it was a gift from Robotnik. As Sonic writes 'Return to Sender' on the package, Robotnik attempts to stop him, as the Spirit of Christmas Present holds him back, saying he can't do anything. Now wanting to go back to his house, he finds himself in the middle of a wasteland: the future. An old man walks up to Robotnik. He laughs at the old man, only to find out that it is him by a yellow caped Sonic, the Spirit of Christmas Future. The Spirit tells him that Robotnik has turned into broken man bent on greed and evil in the future. The Freedom Fighters, all old and worn out, walk by. The Spirit mentions that with all the years of fighting, they have grown tired. He concludes that, even with all the power, Robotnik will have nothing to rule over in the future and that he must end his evil ways. Before he can decide, he looks over to see a large mecha capture the old Freedom Fighters with the old Robotnik celebrating with glee. Robotnik changes his mind, just as an old Sonic arrives, but before he can enter into a spindash to stop him, he trips. A mailman then arrives, giving Robotnik the package that Sonic had sent for return in the present, sent via fourth class, the slowest mail possible. Present Robotnik recognizes the present and runs to stop the old Robotnik, but is too late: the package explodes. In Knothole Village, Sonic is woken up by Rotor, having dreamt the whole thing. Rotor tells him he has slept through most of Christmas, which perks Sonic up, realizing they are on the last page of the comic. He gets out of bed, just in time to wish the reader a Merry Christmas, acting as Santa in a shoe-shaped sleigh with the Freedom Fighters singing Christmas carols and Robotnik stuck in the snow after the explosion. The Spin Doctor is a direct tie-in to the game Sonic Spinball, which came out about 1 month prior to release of this issue. All areas of the game, and some of the badniks in it, are referenced. This is the first issue in the comic series to use Rotor's name correctly, rather than using Boomer. The cover of issue 7, shown in the Sonic-grams segment, is different from the final design. Sonic references the Casino Night Zone in The Spin Doctor. Sonic's Christmas Carol is based on the Charles Dickens story A Christmas Carol. The title has a tie pun.